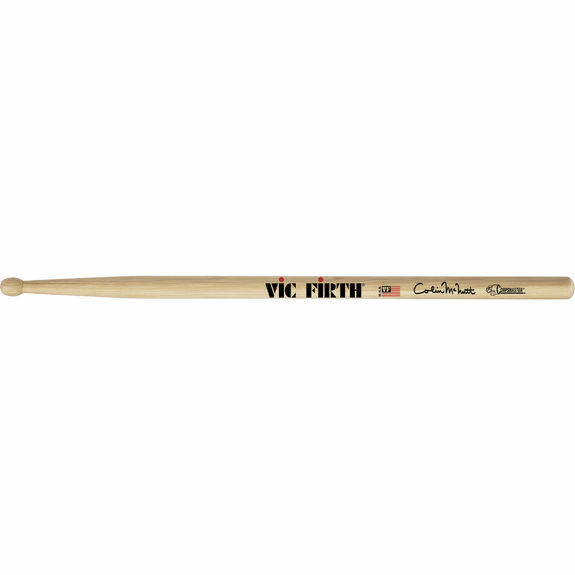 Vic Firth SCM Colin McNutt Marching Snare Drumsticks feature an oval tip with a medium-long taper provides great balance with quick response at all dynamic levels. In honey hickory. Length: 17" Diameter: .690"
Vic Firth SCM Colin McNutt Marching Snare Drumsticks feature an oval tip with a medium-long taper provides great balance with quick response at all dynamic levels. In honey hickory. I have been buying here for three years now and almost always get a great product, but the last couple of sticks I have bought were very light pairs that do not reflect the sticks full potential. I love this stick but feel the staff should check the weight of the stick before sending them out to make sure we get a good product. There is no "good" weight when referring to drum sticks. Some customers prefer light sticks, some prefer heavy. If the sticks fall within Vic Firth's tolerance for a specific model, we treat them as A quality product. If you do not specify what weight of sticks you want, we do not make that decision for you. McNutt's are some of my favorite sticks, but almost all of the sticks I ordered in bulk were dead. I bought 6 pair, and 4 were dead. Contacted Vic, got them replaced, but just something to keep in mind. That aside, the tone and touch from these sticks are great. When Colin designed the stick, he wanted strong, but controllable rebound at all dynamic levels, and this stick provides that. A dark yet articulate sound can be achieved at all dynamics as well. Great design and product development, but quality control needs some work. Wonderful sticks, as long as you get a good pair. Large, but light...nice rebound. Basically what everyone else has said, although I think the comment before means "It's light, and provides great rebound", not "but provides rebound". Makes more sense that way. I meant they're light, but still provide the rebound...I messed up and wrote heavy, but they aren't.